Gardeners with small or limited space find dwarf lilac trees a good way to enjoy the fragrance and beauty of lilacs. Lilacs originally came from Eastern Europe and Asia with cultivars for dwarf varieties improving through the years. Dwarf lilacs grow in hardiness zones 2 to 7 as long as they receive protection from late spring frosts. Dwarf lilacs grow up to 5 feet in height with many of them spreading up to 10 feet in width. The trees produce light green leaves with clusters of highly fragrant blooms appearing in shades of lavender, purple, blue, pink, white or magenta in the spring. The trees lose their leaves in the fall, with most offering little fall interest. One of the more spectacular dwarf lilacs is the Meyer lilac (Syringa meyeri). The Meyer lilac grows up to 5 feet in height but spreads up to 10 feet wide. Meyer lilacs feature a spicy fragrance from flowers that bloom before the leaves appear. In the fall, Meyer lilac leaves turn reddish-brown. The Hers lilac (Syringa julianae var. Hers) grows up to 5 feet tall and 10 feet wide as well, but in a weeping form. The Hers lilac grows well on a trellis. Since it blooms later in the spring than most other lilacs, the tree works well in colder climates since late-season frosts present less of a problem. Dwarf lilacs, like all lilacs, grow best with six hours of sun per day; otherwise, too much shade reduces the number of blossoms. The trees require protection from strong winds to keep the flower buds from getting damaged. The trees grow in neutral to slightly acidic soil that drains well. Some gardeners plant the trees 18 to 24 inches apart to form a thick hedge. Otherwise, the spreading forms of dwarf lilacs require more space in which to grow. Consider adding a layer of mulch to preserve moisture and reduce weeds that compete for water with the lilacs. In June and July, most lilac trees start forming their buds for the following year. The trees benefit from an extra inch of watering each week during this period. Decreasing irrigation in early August helps the trees harden off for winter. A deep watering after the plants go dormant but before frost helps plants go into winter with adequate soil moisture. 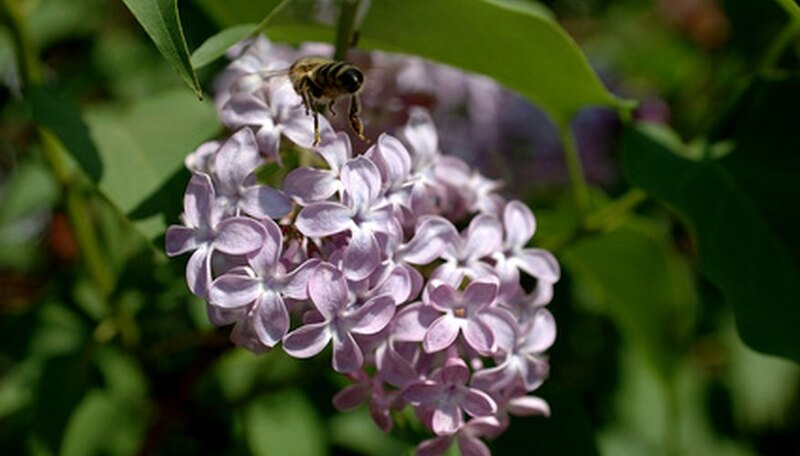 A variety of pests attack lilacs, including the lilac borer, a moth that resembles a wasp. Borers lay their eggs on the trunks and branches of the lilac tree in late spring. Scale insects also wreak havoc on lilacs. They cover the trunks and branches with scaly bumps that protect them while they drink fluids from the tree. Both types of insects cause less damage when the trees receive adequate water and nutrients from the soil. Insecticidal soap or oil sprays also may help eliminate the problem.